Sampling Sichuan cuisine amongst time-travelling sea monsters, bathers, and a Pokémon-Go-style app, Katrina Houghton hopes for an insight into Chinatown’s slow and expansive evolution at Liverpool Biennial 2016. But does it deliver? Liverpool’s been a bit of a cultural melting pot since becoming a city in 1880. Its Chinatown is the oldest in Europe, and has been fundamental to the development of the port city, and Britain’s trade and diversity, since the 1890s. At the top of Nelson Street stands the Chinese Ceremonial Archway, the largest arch in any Chinatown outside of China. It is said to protect the area from evil; a talisman for good fortune. As far as I can see, it seems to be working. A New Chinatown building development is currently in progress, aiming to draw the energy of modern day China into this cultural quarter. In exploring Chinatown as one of their six, thematic “episodes” – all under the wider theme of Time Travel — Liverpool Biennial 2016 seems to ask us to consider a slow and expansive evolution. But does it reflect it? If you are approaching the Biennial through Chinatown, it’s a good idea to start at FACT. Although not technically part of the same episode, it’s a stones-throw away and you can collect some essential literature to guide you through an occasionally difficult-to-navigate festival. The episodes should not be considered as separate entities, as many artists exhibit across several venues, with some venues hosting multiple episodes. Take note of everything you see because it is likely to reappear. FACT is hosting exhibitions by Lucy Beech, Krzysztof Wodiczko and Yin-Ju Chen that get your mind ticking the right rhythm before you explore Chinatown. Mr Chilli’s restaurant on Seel Street was my first stop. It was lunch time, and I was intrigued to dine amongst Elena Narbutaite’s swimming costume-wearing, “interspecies” beings, as promised in the literature, and seen performing live in the Edwardian, Grade II-listed Adelphi Hotel a few weeks ago. Narbutaite is known for creating unexpected social situations where an audience can collectively experience surprise and confusion. Indeed, you may feel somewhat bewildered to see her work presented in the Mr Chilli toilets, in a rather lackluster display of photographs. Sometimes art can speak higher volumes when it is laid bare, free from pristine walls, good lighting and framework. However, this wasn’t one of those times. It felt more like Narbutaite’s images of the tiger and leopard-print swimsuits designed by Eduardo Costa – which I was expecting — had been exiled out of sight. Transferring these images from the Adelphi to the Mr Chilli toilets has removed an essential component in Narautaite’s work, which will leave you struggling to connect the dots. The significance of the Adelphi Hotel is hard to locate amongst images of a woman sat in a bathtub and a man diving into a lake. Speaking to the staff, it seemed as though there has been a miscommunication and the images had been deemed inappropriate for the dinner table. Despite this, the lack of care cannot be excused. 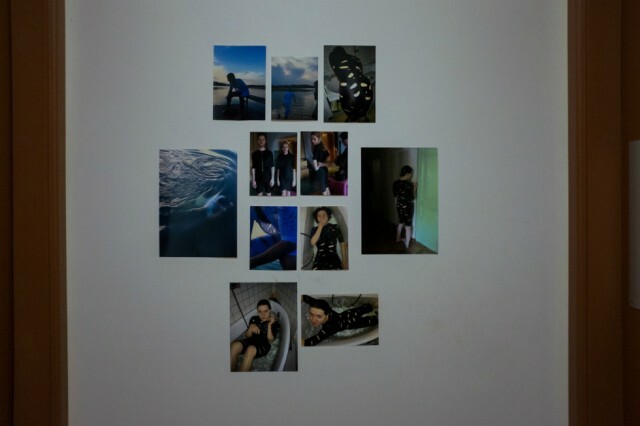 There were photographs missing, with sticky spots left behind and a placard to narrate an image of Sketches for Sun Kiss Feline (above (2016)) that had vanished. A real shame, because the sketches might have helped to execute the concept. Nevertheless, the food at Mr Chilli offers a great insight into Sichuan cuisine. This exhibition is due to change every four weeks. Let’s hope the next round gives us more to work with. Involving local restaurants in this episode of Liverpool Biennial appears to express the significance of gastronomy in the history of the city’s cultural integration. If the stomach is considered to be the second brain, it makes sense to suggest that food can be a communicative tool. Ana Jotta’s “background” paintings entitled No No Sir! (2016) hang on the walls of Master Chef, an Indian tandoori restaurant on Renshaw Street. Jotta is a Portuguese artist known for exploring themes of erasure and authorship. 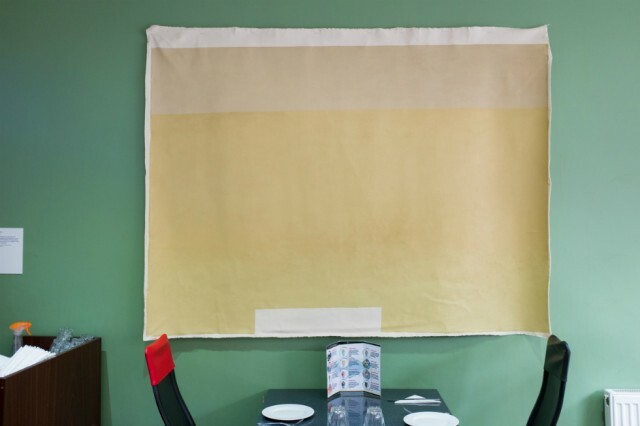 At Master Chef, her abstract paintings hang as raw, un-stretched canvases that blend seamlessly amongst the décor of the restaurant. The composition of the paintings is akin to the work of Mark Rothko; however, where Rothko used intense colour to project high-octane emotional states such as ecstasy and despair upon the viewer, Jotta’s work arouses a more subdued response of calm and unity. 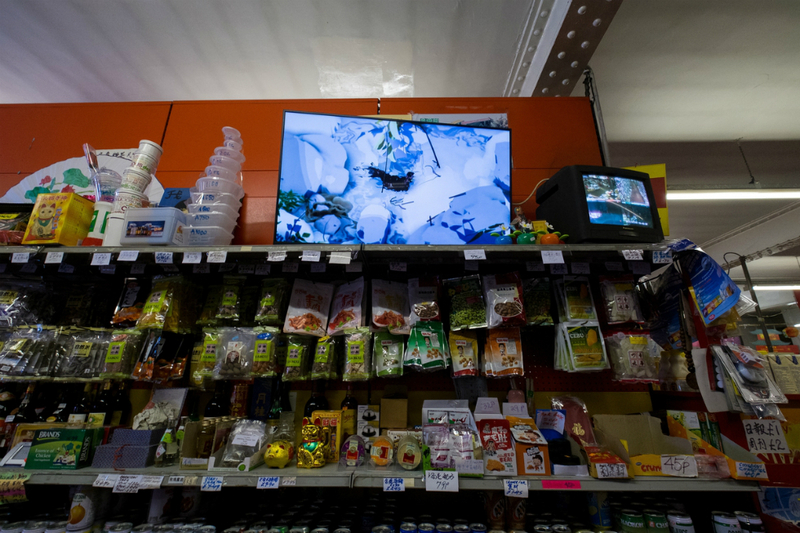 Inside Hondo Supermarket on Upper Duke Street, Ian Cheng’s Something Thinking of You (top (2015)) plays on a screen above shelves of canned food. Cheng’s work explores the boundaries of intellect in a computer simulation, that has been pre-programmed to a screenplay and left to evolve on its own. The concept is innovative and asks the viewers to comprehend their own consciousness. Cheng’s animation resembles some sort of sea monster prowling a lake. If this is the universe that technology would create if given the chance, I’m not sure I would like to live in it. At the checkout, you will find a printed copy of Lu Pingyuan’s story The Two Sided Lake (2016) to take away. Pingyuan harmoniously compliments Cheng’s work in her tale of a diver who enters a wormhole through a lake that leads him to another lake in China. Though unassuming, this new work has strong connotations to Chinese philosophy and encourages the viewer to look through the eyes of the community it sits within. Simon, who owns the supermarket, tells me that he has worked at Hondo for 40 years, and this year will be the last when he retires and makes way for a new generation. I pass a New Chinatown poster along Great George Street, on my way to the next venue Cains Brewery. “Changing the face of the city”, it proclaims. 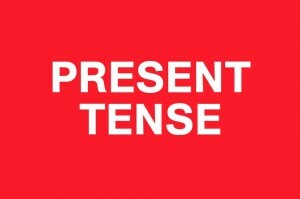 In this small way, the experience of the overarching theme – time travel – is enhanced. Cains Brewery is a marvellous building and feels like the epicentre of the festival. Inside, a sculptural work by Andreas Angelidakis, called Collider (below (2016)), references the Large Hadron Collider particle accelerator at CERN. Angelidakis’ circular structure stands in the middle, separating the cavernous space into the Flashback episode within its inner corridors, and the Children’s episode at its core. Outside is Celine Condorelli’s Chinatown Portal (2016), which resembles a doorway and alerts the onlooker to his or her own reflection. Offering an imagined passage through time and space, the portal asks you to consider the lives of migrants and the parallel realities of exclusion and inclusion. This idea, however, is perhaps only resonant when considered amongst other Biennial works that share similar themes of immigration and displacement — such as the Krzysztof Wodiczko exhibitions at FACT. Otherwise, Condorelli’s Chinatown Portal works as chapter heading for the episode that may have been better situated at the borders of Chinatown. 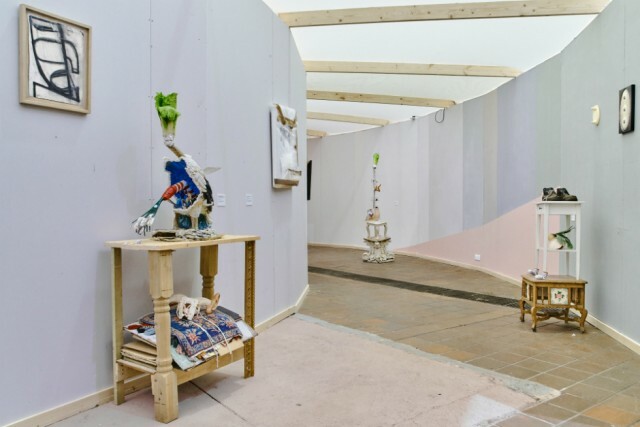 Nearby, artists Ramin Haerizadeh, Rokni Haerizadeh and Hesam Rahmanian have “smuggled” a glorious assemblage of objects to Liverpool in a shipping container from Dubai, where the Iranian artists are currently living in exile. The trio’s practice spans a multitude of genres, incorporating components from sculpture and performance to installation and drag. Sculptural works such as Love Trap (2014-2016) and King Above Us All (2016) fuse together plastic fruits, a car muffler and a teapot alongside more valuable objects such as a Louis Bourgeois painting from their personal art collection. In their video Operation Report (2016), the trio takes on the identity of three unlikely super heroes, named Anti-Gatty, Space Sheep and Princess Rambo who use their unique powers to stay ahead of authorities. Using art as a guise, Haerizadeh, Haerizadeh and Rahmanian highlight global oppression whilst evading prosecution, their personal experience strengthening their message. The trio’s work is undoubtedly some of the strongest and most prominent across the Biennal, with more to be found at Tate and Open Eye Gallery. 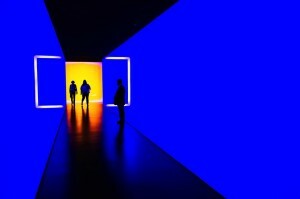 However, the over-exposure of their garish aesthetic across the venues can almost de-sensitize its audience, and enhances the at times confusing narrative of this time-travelling Biennial. Almost a counterpoint to this muddled approach to boundaries and themes, Cheng makes a second appearance at Cains, with a well-timed provocation amidst the current Pokémon-Go frenzy. Emissary Forks For You (2016) is a mobile reality app that will have you running around the vast industrial space trying to please a small dog named Shiba Emissary. As well as being playful and questioning reversed user roles, the app is a great navigation tool to explore the other episodes in this venue. As I leave Cains Brewery, I look back through Celine Condorelli’s Chinatown Portal and remember the people I talked to at Mr Chilli and Hondo, and the artists I “met” along my walk. 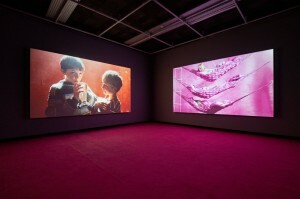 Considered in context of the 2016 Biennial, the Chinatown episode conveys a success story in light of the current global attention on migration; highlighting much needed investment in the area; a rich variety of international artists; and touching on freedom of movement and the importance of imagination and collaboration. Yet under scrutiny, and considering my first impressions of an episode that would reveal a slow and expansive evolution, Chinatown’s narrative feels unresolved and incoherent. As with Narautaite’s work, I struggled to connect the dots of the whole episode. What a shame, because this episode has a close affiliation to the idea of time travel, and to Liverpool’s past, present and future. Liverpool Biennial asks us to experience Chinatown by visiting its establishments; however, the works on show offer little association with the community’s, culture, history and people. It is disjointed, and unfortunately feels like a conversation starter rather than an insight.